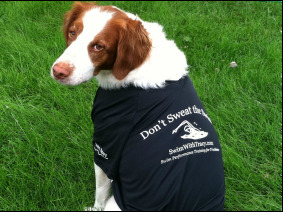 Meet Tracy - Don't Sweat the Swim! Swim Performance Training sessions speak to each person’s unique way of learning and grasping concepts in order to improve their swimming. Drills are frequently modified or designed for each person’s strengths and weaknesses. I pride myself in being able to successfully communicate all aspects and nuances of swimming to a wide range of abilities and personalities. I can and will help you reach your goals! Real Estate and Racing; WinWithTracy! The following experiences have allowed me learn and grow not only as an individual and an athlete but also as a successful coach. Being able to "walk the walk and talk the talk" is vital when working with goal driven individuals who place their trust in me when preparing them for participation or competition in sport. 2009 Athens, Greece Marathon on the historic marathon route. Since age 9, a quadrillion swim meets! To strive to reach a balance between work, play, training & just plain fitness. But most importantly, to continue reaping the health benefits and pure enjoyment of being active! Driven and goal oriented, Tracy earned a swimming scholarship to, and her B.A. in Sports Management from, Washington State University in 1989. She went on to earn her M.A. in Athletics Administration in 1991 from Michigan State University while holding the position of Graduate Assistant Women’s Swim Coach for the Spartans. After graduation she became an assistant men's and women's swim coach for Kansas Jayhawks. Prior to working with top notch Division I athletes, including several Olympic Trial qualifiers, she has enjoyed working at every level of swimming since around 1987. Today, Tracy continues to compete in triathlons and work with swimmers and triathletes of all ages and abilities to improve their swim technique through swim performance training sessions. Prior to earning her real estate sales license, Tracy was involved in sports marketing at the Division I collegiate and professional levels. She was involved with everything from group ticket sales to merchandising, and from event management logistics to sponsor relations and fundraising. It was when the Columbus Quest left town that Tracy seized the opportunity to apply her skills and experiences in a dynamic real estate industry where she’s become a successful Realtor. Tracy has been working with buyers and sellers at all price points in Central Ohio since 2006. Her coaching, sales and marketing backgrounds contribute to her creativity, negotiation skills and effective communication. She prides herself in being able to successfully communicate with a wide range of personalities and apply her life-long career experiences to all aspects of the buying and selling processes. Maintaining a high standard of professionalism that is combined with an energetic and personal touch, Tracy continues to reach the goals set by her and her clients as a team, regardless of the setting. Real Estate and Racing….You will Win With Tracy! Tracy is the co-captain of Team Hendershot, est. 2002, along with husband Bob. 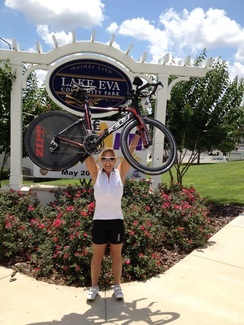 They frequently take "RACE-Cations" to exotic locations and sight see by running or renting bikes. 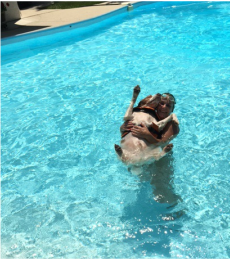 Team member Jaxson has honestly provided insight to swimming and Tracy frequently mixes her favorite drill-to-date, known as the dog paddle, into her group practices. Most recently Jaxson even learned the backstroke. It turns out you can teach an old dog new tricks! Turns out you can teach an old dog new tricks.... or the back stroke! Whether you or someone you know is ready to buy or sell a home, I AM ALSO YOUR REAL ESTATE COACH! Referrals in real estate, just as in “Swim Performance Training” are the heart of my business. I appreciate you thinking of me for all your real estate needs as well as your training needs!